he 2012 Honda Odyssey get completely redesigned and remains the class-leading minivan for safety ratings and fuel economy, while continuing to offer the refinement, space and engaging driving experience that people have come to expect from this highly acclaimed family vehicle. 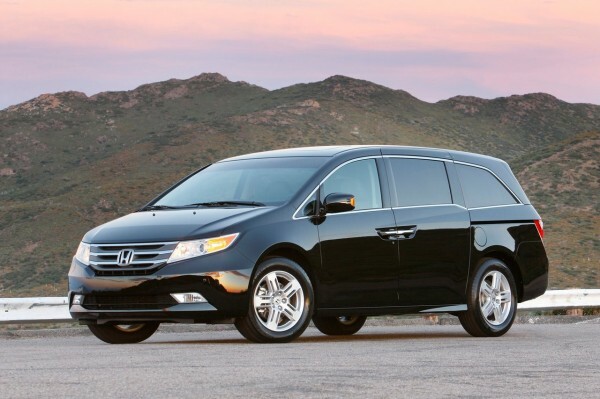 Class-leading highest EPA highway fuel economy rating for an 8-passenger minivan of 28 mpg for 2012 Honda Odyssey Touring. Plus, all Odyssey models achieve the best possible safety ratings from both the National Highway Traffic Safety Administration (NHTSA) with a five-Star Overall Vehicle Score and the Insurance Institute for Highway Safety (IIHS) with a TOP SAFETY PICK, an achievement that no other currently-tested minivan can match. Designed and built in the US, the 5 available models consist of the 2012 Honda Odyssey LX, EX, EX-L, Touring and Touring Elite, with each providing a unique combination of features, value, luxury and in-vehicle entertainment technology. Changes for 2012 Honda Odyssey include the addition of select features to the 2012 Honda Odyssey EX that were previously exclusive to the Odyssey EX-L. 2012 Honda Odyssey EX now includes the intelligent Multi-Information Display (i-MID) with an 8-inch TFT screen, Bluetooth® HandsFreeLink®, a 2-GB CD Library and a USB Audio Interface. The 2012 Honda Odyssey Touring receives an exclusive exterior color, White Diamond Pearl, replacing Taffeta White on the prior model. Who Parents Completely Are Against/Dumbfounded By Your Honda Love?